This is a very simple and delicious recipe. It has the goodness of all the vegetables you use as you do not overly cook them but you want to keep them crunchy and colorful. Also, you can add or remove vegetables according to your own taste and liking. I usually adapt my recipes according to with what I have available at home or might add some green (spinach, broccoli) or some yellow pepper etc. Another thing is that I do not use is measuring cups, I will approximate the quantities I am using but at the end of the day you need to let your intuition free go with the flow 🙂 It will never fail you! You will need to get a big pan, big enough to fit all your vegetables which you have already cut into small pieces. If you want you can use some oil, a few drops just to spread on the bottom of the pan. Whenever I use some oil I usually prefer olive oil. If you don’t want to use oil then just let the pan to heat up and put your vegetable in order to sauté them. 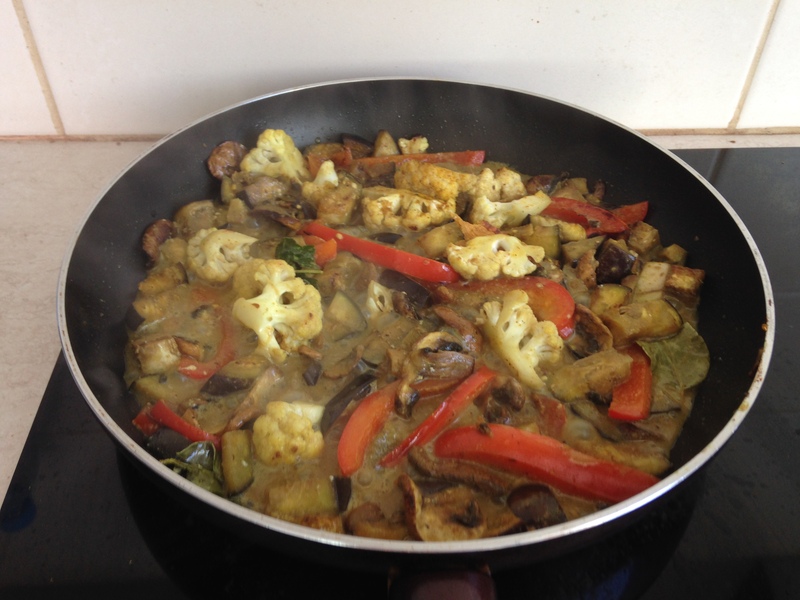 So you add your mushrooms, eggplant, red pepper, cauliflower or any other vegetables you have at hand. After you give them some stir and you see that they all started to get some color, not much, add your spices. Cumin, turmeric, curry powder and if you want some heat you can add some cayenne pepper. Just stir your spices in the mixture and you will feel their smell intensify the moment they fill the heat of the pan. Then add your coconut milk, kaffir lime leaves, and galangal, put the heat low and just let your vegetables come together with the spices and the coconut milk. 5 to 10 min should be enough. In the meantime prepare your noodles, however the package advice you. For some you just need to soak them in water, other might need some boiling. When you have your noodles ready add them to the vegetables and stir them in so they get covered with the sauce. If you want you can use some soy sauce or tamari which is gluten free. Taste them and adjust your spices according to your liking.